Police Log Valentine Dreams! 11 Strains of bliss. STRAINS PICTURED ON COVER, FROM LEFT TO RIGHT TOP THREE - 1.GOD BUD 2.AK47 3.GRAND DADDY PURPLE MIDDLE FIVE - 4.PURPLE KUSH 5.L.A. CONFIDENTIAL 6.PURPLE 7.SUPER SILVER HAZE 8.GRUNK BOTTOM THREE - 9.N.Y. CITY DIESEL 10.W ILLIAM'S WONDER 11.CRITICAL JACK THE W INE GLASS IS FILLED W ITH PURPLE. PHOTO: GERRY K. FOR OCC. 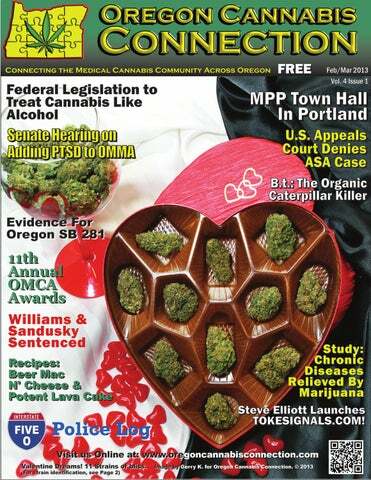 OREGON CANNABIS CONNECTION is a bi-monthly publication for the medical cannabis community in Oregon. Published by K2 Publishing Co. in Southern Oregon, we strive to inform the public on the value of medical marijuana, as well as provide news, information, and opinions concerning marijuana laws, legalization, and medicine. All information in our publication is intended for legal use by adults only. Our publication is advertiser supported and over 20,000 copies are available FREE at over 225 locations throughout Oregon. Evidence In Support of Oregon Senate Bill 281 By Cheryl Smith Exec. Dir. Compassion Center Every couple of weeks, a patient comes into Compassion Center asking about getting a medical marijuana card for their posttraumatic stress disorder (PTSD). Unfortunately, PTSD is not a qualifying condition under the Oregon Medical Marijuana Act (OMMA). Many of these people do have another condition—such as pain, muscle spasms or nausea—but others do not; so they are out of luck. They cannot legally use this herb that has been shown, both anecdotally and by studies, to help with the distressing thoughts and memories that haunt them. In a survey of Compassion Center patients in 2010, we learned that about 25% of our patients are veterans. A disproportionate number of veterans experience PTSD, but it can affect anyone who has experienced severe trauma. We also learned that many of our patients who use medical marijuana for a condition that is covered by the OMMA also find it helpful for a condition that is not covered—such as anxiety, insomnia or PTSD. Nearly 9% reported that they use it specifically for their PTSD. While reflecting only a small percentage of those participating in the OMMP, this survey echoes what we have learned from different studies: medical cannabis can be effective in combating PTSD. A study from Canada found that 72% of individuals treated with synthetic THC experienced significant reduction of PTSDcaused treatment-resistant nightmares. A report from Israel found that cannabis can improve the quality of life for sufferers of PTSD. In Oregon, Alan Cohn, MD, a psychiatrist working with Lane county jail inmates for more than 35 years, noted that using marijuana contributed to success in the community for individuals suffering from PTSD. Oregon News Several previous attempts at getting posttraumatic stress disorder (PTSD) added to the list of qualifying conditions under Oregon Medical Marijuana Act failed, because of flaws in the Oregon Administrative Rules or their interpretation. A rewrite of those rules again fell short, but has not been tested. Now we have hope that the tedious administrative process can be avoided and we can still add PTSD to the OMMA. Senate Bill 281 was introduced on January 4, 2013 by Senator Brian Boquist, RDallas. It has already been referred to the Health Care and Human Services Committee and the first public hearing was on February 7. This proposed law is simple yet elegant. Other than other minor changes, it simply adds PTSD as a qualifying condition for participation in the Oregon Medical Marijuana Program. This small change is long overdue, and will go a long way to helping veterans and other survivors, who have no physical injuries that cause symptoms, but want to be able to treat their PTSD with a less harmful alternative that actually works. If you are interested in ensuring that SB 281 is passed, contact your State Representative and Senator to encourage them to sponsor or vote in favor of this bill when it comes before them. You can also contact your local medical marijuana organizations to find out the status of public hearings or the progress of the bill. Cheryl K. Smith is an Attorney, a Writer and Executive Director of Compassion Center, a nonprofit medical marijuana clinic and educational organization located in Eugene, Oregon. This year’s vendors included those who cater to the medical cannabis community along with a variety of goodies that cater to everyone. The free day event was open to the public and included a lawyers’ information panel, featuring Paul Loney, last year’s OMCA Freedom Fighter Award winner. The sustainable fashion show, coordinated by Nickie Gates was a fitting Grand Finale for the day. “Every year we strive to make the day event better by having a wide variety at our Holiday Bazaar,” saids Madeline Martinez, owner of the cafe and innovator of the event. ”This year, we decided to include specialties that are helpful to medical cannabis patients like baked goods and body care products. It’s very exciting!” David Bram, creator of the scoring method used by the OMCA, is the first to learn the results. He created a bar code system that ensures anonymity. In all the years that he has done this, there has yet to be a breach of confidentiality, which has helped earn the OMCA it’s reputation. Oregon News Nugs Another Eastern Oregon SAP Raided Raided The Blue Mountain Enforcement Narcotics Team arrested the operator of a Eastern Oregon Safe Access Point (SAP) on January 21 and 22. With the assistance of Hermiston police, they executed a search warrant Monday at the Pacific Northwest Medical Cannabis Association in Hermiston. Pendleton police chief Stuart Roberts said the busts came after two months of investigations. The police accuse the operation of illegally manufacturing and distributing marijuana throughout Eastern Oregon and eastern Washington. In a written report, Roberts said, “[the] suspects were responsible for distributing marijuana to people of all ages including teenagers and the elderly.” Police arrested the business's president John Partlow and two others, one being a woman from California. Charges included manufacture, possession and delivery of marijuana, possession of methamphetamine and possession of psilocybin mushrooms. Officers seized more than 15 pounds of marijuana, 257 marijuana plants, a small amount of methamphetamine and psilocybin mushrooms and approximately $9,000 cash. He also indicated they operated outside of state, and federal, guidelines. One must wonder, can a person deal in any way with marijuana and be within federal guidelines? Sounds disingenuous. Oregon News that are usually treated with pharmaceuticals. Founded just this year by directors Anthony Taylor and Cheryl K. Smith, Compassionate Oregon will also work to resolve issues surrounding the Oregon Medical Marijuana Program (OMMP) that continue to be problematic for both patients and law enforcement. Toward that end, the PAC will work to elect legislators who are supportive of the OMMP and to support initiative campaigns that will improve the program. Anthony Taylor is a long-time activist best known for his work with the Oregon Marijuana Initiative during their 1980’s campaign to legalize marijuana for adults in Oregon,where he participated in the signature drives. He was later the Lane County Coordinator for the Ballot Measure 5 campaign in 1986. As a lobbyist for the Oregon Marijuana Initiative, Anthony was responsible for legislation that gave us the early turn-in law for initiative signatures. He has recently become active again in cannabis politics. Cheryl K. Smith is an attorney and has been the Executive Director of Compassion Center, a Eugene-based nonprofit, since 2009. She previously served as Legal Services Director for Oregon Rehabilitation Association and Staff Attorney for the Hemlock Society. She was the primary drafter of the Oregon Death with Dignity Act. Compassionate Oregon’s first goal, and the subject of the recent hearing before the Senate Health and Human Services Committee, is to add PTSD to the list of qualifying conditions for the use of therapeutic cannabis. In addition, Compassionate Oregon will work toward reducing the cost of cardholder fees and resolving some of the problems often experienced between patient and program. 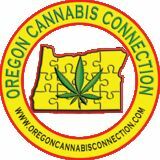 Reach 50,000 cannabis consumers, advertise in the Oregon Cannabis Connection! As Oregon's only statewide cannabis centered newspaper, we can deliver customers to your business. Over 10,000 papers in the Portland metro area alone! Ads star t as low as 119.00 per issue, and include full color and ad layout! Email Keith@oregoncannabisconnection.com or call 541-621-1723 for rates and Info. in possession of approximately 40 pounds of marijuana in a Grants Pass-area motel parking lot. January 23 – Wilsonville An Oregon State Police (OSP) traffic stop south of Wilsonville led to the arrest of a Washington man after the trooper found over 14 pounds of marijuana inside the man's car. The OSP Drug Enforcement Section is continuing the investigation. On January 23, 2013 at approximately 12:26 a.m., an OSP senior trooper stopped a 1999 Honda Civic four-door displaying Washington license plates for traffic violations northbound along Interstate 5 at the Baldock Rest Area near milepost 282. The car's driver was identified as a 36 year old male from Parkland, Washington. Subsequent investigation during the traffic stop, with the assistance of a Clackamas County Sheriff's Office drug detection canine, led to the discovery of approximately 14 pounds of marijuana concealed inside the car. Estimated value of the seized marijuana is $30,000. The suspect was taken into custody without incident for Unlawful Possession and Distribution of a Controlled SubstanceMarijuana and lodged in the Clackamas County Jail. On February 4, 2013 at approximately 12 noon, detectives from the Rogue Area Drug Enforcement (RADE) team responded to assist Grants Pass police officers at a motel parking lot on 7th Street where officers responded to an unrelated disturbance call. While at the motel, officers contacted a male, age 32, smoking marijuana in the parking lot. A vehicle associated with the suspect and a second male, age 31, had a very strong odor of fresh marijuana emanating from the trunk area. A subsequent investigation by RADE detectives led to the discovery of five plastic garbage bags containing a total of approximately 40 pounds of marijuana in the vehicle. Both men were cited to appear at a later date in Josephine County Circuit Court for Unlawful Possession and Delivery of Marijuana. The investigation is being continued by RADE detectives. Lakeview District January 20 - Ontario Two men from Boise, Idaho were arrested when an Oregon State Police (OSP) trooper stopped a vehicle on Highway 201N near Ontario and discovered approximately 3 pounds of marijuana in their vehicle. OSP Drug Enforcement is continuing the investigation. On January 20, 2013 at approximately 1:25 p.m., an OSP senior trooper stopped a vehicle for an unspecified traffic violation on Highway 201N near Ontario. The 2003 Chrysler 300 was occupied by a male driver, age 33, and male passenger, age 32, both from Boise, Idaho. Subsequent investigation during the traffic stop, with the assistance of an OSP drug detection dog that responded to the scene with its handler, led to the discovery of approximately 3 pounds of marijuana hidden inside the vehicle. Estimated value of the seized marijuana is $7,000. Both men were were taken into custody without further incident and lodged in the Malheur County Jail for Unlawful Possession and Distribution of a Controlled Substance - Marijuana. January 23 – Burns Three Utah residents, including a mother and her son, were arrested when Oregon State Police (OSP) troopers stopped two vehicles traveling together on Highway 20 about twenty-five miles east of Burns and discovered approximately 69 pounds of marijuana. They were followed by a 2006 Chevrolet Trailblazer driven by a woman, age 47, from Francis, Utah. It was during the course of the traffic stop that the troopers learned the two vehicles were traveling together to Salt Lake City. Subsequent investigation during the traffic stops, with the assistance of a Harney County Sheriff's Office drug detection dog that responded to the scene with its handler, led to the discovery of approximately 69 pounds of marijuana in large duffel bags in the back of the Chevrolet Trailblazer. Estimated value of the seized marijuana is $170,000. processes for PTSD and the importance of our endocannabinoid system and its regulation of PTSD. The three people were taken into custody without further incident and lodged in the Harney County Jail for Unlawful Possession, Distribution, and Manufacture of a Controlled Substance - Marijuana. Bail was initially set at $150,000. A group of veterans came next, bringing further expertise and direct experience to the hearing in often emotional testimony. January 24 – Bend An eastern Idaho man was arrested when an Oregon State Police (OSP) trooper stopped a vehicle on Highway 20 about fifteen miles east of Bend and discovered approximately 40 pounds of marijuana. The OSP Drug Enforcement Section HIDTA Interdiction Team (HIT) and Central Oregon Drug Enforcement (CODE) Task Force assisted in the ongoing investigation. On January 24, 2013 at approximately 11:14 a.m., an OSP senior trooper stopped a rented 2013 Chevrolet Cruz displaying Utah license plates eastbound on Highway 20 near milepost 18 for unspecified traffic violations. The vehicle's driver was identified as a male, age 29, from Ammon, Idaho. Subsequent investigation during the traffic stop with the assistance of an OSP drug detection canine led to the trooper's discovery and seizure of approximately 40 pounds of marijuana concealed in the vehicle. Estimated value of the seized marijuana is $100,000. The suspect was taken into custody without incident and lodged in the Deschutes County Jail on charges of Unlawful Manufacture, Possession, and Delivery of a Controlled Substance Marijuana. On January 23, 2013 at approximately 9:37 a.m., an OSP sergeant and trooper stopped two separate vehicles traveling together eastbound on Highway 20 near milepost 158 for several unspecified traffic violations. The lead vehicle was a 1999 Toyota Camry driven by a 24 year old male, accompanied by a male passenger age 25, both from Salt Lake City, Utah. traffic stop led the trooper to discover a total of approximately 6 pounds of marijuana in two separate locations in the pickup. Estimated value of the seized marijuana is $15,000. The suspect was detained and later cited and released to appear at a later date in Lake County Circuit Court of Unlawful Possession of a Controlled Substance Marijuana. The OSP Drug Enforcement Section is continuing the investigation. Cannabis addresses the underlying neurobiological processes directly and alleviates core symptoms of PTSD with few clinically significant adverse effects,” Krumm told the committee. Oregon News He broke down six areas where they focused their efforts: Cooperation, Education, Timing, Drafting, Organizing and Advertising. Cooperation was where he focused first. Understanding the many different groups, opinions, and concerns in a state is important, and getting them consolidated behind a single effort is vital. Addressing Oregon's failed effort in 2012 specifically, Fox pointed out that our two ballot initiatives (I-9 and I-24) ended up competing for the money from the same sources. In the end only one initiative made the ballot (I-9 which became Measure 80), and it failed to pass in November. the production of industrial hemp, where there is bi-partisan agreement on dealing with its prohibition. When asked by Russ Belville, of The Russ Belville Show, if the Republican controlled congress will even allow hearings on any marijuana related bills, Blumenauer responded, “The issues that we are talking about - states rights, issues like medical marijuana, looking at the merit of it's current treatment under the law – there is bi-partisan interest in exploring this.” Blumenauer explained to another attendee that the federal government has a responsibility to create clarity and consistency, but he added, “I also think it's important, in Oregon and every state, to get it's act together in terms of procedure and oversight...I think the more uniformity the better.” Rep. Blumenauer has been working diligently for Oregonian's in Washington D.C. He is a true friend to marijuana users and continues to fight for the end to marijuana and hemp prohibition. If just a few other lawmakers in Washington could do the right thing, cannabis would become a legitimate medicine, an acceptable method of recreating, an unbelievable renewable resource, and a huge boost to the worldwide economy. Maybe he can lead the way. Steve Fox spoke second. The Director of Government Relations for MPP and coauthor of Marijuana is Safer Than Alcohol, So Why Are We Driving People To Drink, Fox was instrumental in getting Colorado's marijuana legalization initiative, Amendment 64, passed. Being the largest marijuana law reform organization in the country, MPP has long been helping states get their marijuana laws changed, usually for medical patients. From Delaware to Arizona, MPP has had tremendous success getting laws passed, especially initiatives. But, in 2012, Colorado and Washington residents passed their full legalization measures, and MPP was crucial to the success in Colorado. Fox, who helped organize the Colorado campaign strategy with Mason Tvert of SAFER, Brian Vicente of Sensible Colorado, and others on the groud there, spent an hour explaining the reasons for the success in, what could be considered, a fairly conservative state. “If there's cooperation and you listen to as many voices as possible, and are open to the idea that maybe your idea isn't the best idea, you end up with very good legislation,” Fox added. Their education efforts focused on a public education campaign, which began way back in 2005, seven years before A-64. With others around the country focused on medical marijuana, they launched an education effort in Colorado explaining to the public that “marijuana is less harmful than alcohol and it makes no sense to punish people who want to use marijuana instead,” Fox said. Steve Fox of MPP. He helped CO. pass their law in Nov.
Cont. From Pg. 6 of dealing with PTSD, a few Oregon activists, and many military veterans. Included were John Sajo of Voter Power, Mary Houck of Southern Oregon Cannabis Community Center, Jim Klahr from the ACMM, Anthony Johnson from the National Cannabis Coalition, Dan Koozer from Willamette NORML, and more. Many traveled a long way to testify. measure, accepted the Freedom Fighter Award, saying, “We came so close. We will keep on fighting until we win. Thanks to Washington and Colorado, this will be easier now.” After a fabulous dinner catered by the Headwaters Cafe, Jay Mack and Big Dub stopped by to perform new songs from their latest CD, Still Medicated, and some faves from their “Heavily Medicated” CD. It was an honor to have them; they have supported the cafe since it began. They have had some serious struggles lately, and the cafe hosted a fundraiser for them on January 12, 3013. A number of veterans also appeared, including a couple of Vietnam vets, and Seth Grant, a vet from Iraq. Grant gave heart wrenching testimony about how PTSD affected his life and how marijuana helps him with symptoms. The crowd support was enormous and the testimony was very compelling. No opposition was raised, even in the form of questions from Senators. The next step is for the committee to give the bill a “Do Pass” recommendation which advances it for further consideration in a work session and other possible committee assignments. Hopefully, this bill will make it to the floor of the legislature and pass. Marijuana is effective on PTSD, and the facts support it, lets hope Salem does, too. Another important step is to correct the flawed system which makes adding new conditions to the OMMA nearly impossible and under the control of just a few bureaucrats. We need a fair and reasonable system with decision makers that understand cannabis, instead of bureaucrats that don't. National News (D-CO). Senate Judiciary Chairman Patrick Leahy (D-VT) also recently said he will hold hearings on changing federal marijuana law. Minority Leader Mitch McConnell (R-KY) recently said it is time to allow U.S. farmers to grow hemp, which would take a change of federal law. A recent Rasmussen poll found that 56 percent of respondents support regulating marijuana in a manner similar to alcohol and tobacco. Polling also finds that about three out of four Americans support medical marijuana programs. Public Policy Polling, in a survey taken from November 30 to December 2 last year, similarly found that a record-high 58 percent of Americans think cannabis should be legal. To date, 18 states and the District of Columbia have legalized marijuana for medical use, and 15 states have decriminalized marijuana for personal adult use. In November of 2012, voters in Washington and Colorado made history by passing the country’s first measures to regulate marijuana like alcohol. “To have these two bills introduced in one week, this early in the Congress, is unprecedented,” said Jasmine L. Tyler, deputy director of national affairs for the Drug Policy Alliance. In light of the growing momentum behind efforts to regulate marijuana like alcohol at the state and federal levels, MPP has changed the name of its federal political action committee from the “MPP Medical Marijuana PAC” to the “Marijuana Policy Project PAC.” See the difference? The new name includes recreational legalization. “The re-naming of our PAC reflects the new reality in Washington, D.C.,” Fox said. “Following the passage of the initiatives to regulate marijuana similarly to alcohol in Colorado and Washington last November, there is finally significant momentum in Congress behind ending marijuana prohibition across the board at the federal level.” “The introduction of the two new bills this week is evidence of [a] philosophical shift,” Fox said. “While we are obviously still committed to protecting medical marijuana patients and providers, our PAC’s new name reflects our broader mission in Congress. “The end of marijuana prohibition is coming, and we plan to support elected officials and candidates who favor the repeal of this unfair, irrational, and wasteful policy,” Fox said. Rep Jared Polis’ bill will end federal marijuana prohibition and let states decide their own marijuana policies without the threat of federal interference, and would set up a regulatory process – similar to the one for alcohol – for states that decide to legalize. Rep. Earl Blumenauer’s bill would create a federal tax on marijuana. By Keith Mansur Oregon Cannabis Connection The federal government's “mandatory minimums” resulted in the sentencing of two outspoken and determined cannabis dispensary owners in January and February. Judges in the federal courts of Montana and California were bound by minimum sentencing guidelines, and the defendants will spend 15 years of combined time in prison. In California, Aaron Sandusky was sentenced to 10 years for operating 3 dispensaries that were allowed under the state's medical marijuana law. Quite possibly due to a prolonged legal battle with the city of Upland over a dispensary zoning ban, federal authorities decided to make an example of him, and raided his dispensary in Upland, G3, twice between November 2011 and March 2012. Under federal law, marijuana is considered a narcotic drug with the same penalties as heroine and cocaine. Also, federal law spells out strict guidelines on sentencing narcotic drug traffickers, which is what the law considered Sandusky. The judge essentially had no choice in the minimum sentence. Steve Elliott Launches TOKESIGNALS.COM! From Oregon Cannabis Connection When Toke of the Town editor Steve Elliott was sacked by Voice Media after three-plus years at the helm, some in the community though they'd heard the last of him. But to the delight of his readers and the dismay of his detractors, Elliott has returned with a new website, TokeSignals (http://tokesignals.com). "Writing about cannabis is what I do,"
The judge in the case, U.S. District Court Judge Percy Anderson said, "In this case, as the defendant was warned, the court's hands are tied, whether you agree with the defendant's position or not." Sandusky faced as much as life in prison. Sandusky was convicted of one count of conspiracy to manufacture marijuana plants, to possess with intent to distribute marijuana plants and to maintain a druginvolved premises; and one count of possession with intent to distribute marijuana plants. Chris Williams of Montana was sentenced to a five year term. He operated a number of dispensaries in Montana called Montana Cannabis, with 3 others. His partners all took plea deals from the U.S. Government, but Williams decided not to take a plea, and fought it instead. Williams eventually was convicted by a jury and was facing a mandatory minimum of over 80 years in prison due to the 8 charges against him. Part of the issue was four gun violations from the raids possessing a firearm in furtherance of a drug trafficking crime. Each violation carries a 5 year minimum sentence, and all have to run consecutively. In a rare case, the judge allowed a post conviction plea deal and dropped 6 of the convictions - conspiracy to manufacture and possess with the intent to distribute marijuana; manufacture of marijuana; possession with intent to distribute marijuana; and three counts of possessing a firearm in furtherance of a drug trafficking crime. The only convictions that were left to stand were one count of possessing a firearm in connection with drug trafficking and one count of possession with intent to distribute marijuana. Unfortunately, Williams firearms conviction carried the stiffest sentence...5 years minimum, to a maximum of life. The marijuana conviction was only a 5 year maximum sentence, no minimum. As I have said before, marijuana and firearms don't mix well, especially if the feds are involved. Elliott told the Oregon Cannabis Connection. "Whether or not Village Voice happens to be paying me for it is immaterial. "I was writing about cannabis for years before I was associated with Toke of the Town, and I'll continue to write about it, as long as it interests me," Elliott said. "I don't see that changing anytime soon." So how is Toke Signals different from Elliott's old site, Toke of the Town? "One crucial and major difference is that, with Toke Signals, there is no corporate oversight, no corporate control of content," Elliott told us. "There are no bosses to tell me, 'You can't say that,' or 'You can't piss this person off.' "From here on out, it's gloves off, no-holdsbarred journalism," Elliott vowed. "I can promise you there'll never be a dull moment." Steve Elliott has been a long time contributor to Oregon Cannabis Connection, as well, and his insights and opinions will continue to be covered in OCC. Thank you Steve, and keep up the good work! The State Of Jefferson's Newest Album Featuring Two Is Betta Water Song Country Me Walkin' Man and More! Available at Amazon, iTunes, CDBaby and more! separate Vermont cities located throughout the state found that one out of two Vermonters support legalization, while 40 percent oppose the idea. Vermont is one of a growing number of states where lawmakers are considering full cannabis legalization. NORML will continue to update you in the coming weeks as this proposal moves forward at www.NORML.org. New Hampshire A group of five bipartisan lawmakers have introduced legislation that seeks to make New Hampshire the third state to legalize and regulate the adult use of marijuana. House Bill 492 legalizes the possession of up to an ounce or less of marijuana and the private cultivation of a limited number of marijuana plants for adults 21 years of age and older. HB 492 would also allow for commercial cultivation and sale of marijuana. Full text of this measure can be read at www.NORML.org. Polling conducted in January of 2013 by Public Policy Polling reported that when asked if they would support or oppose changing New Hampshire law to regulate and tax marijuana similarly to alcohol, 53% responded they would support this law and only 37% were opposed. NORML will continue to update you in the coming weeks as this proposal moves forward at www.NORML.org..
Medical marijuana patients in Michigan will be scrambling for safe access to their medicine after the state Supreme Court ruled February 1st that dispensaries are illegal in a 4-1 decision. Michigan’s 125,000-odd medical marijuana patients will now legally only be able to grow their own cannabis or have it grown for them by one of about 26,000 caregivers licensed by the state, reports the Huffington Post. The Supreme Court upheld a Michigan Court of Appeals decision after hearing arguments last October. The case considered the legality of sales of medical marijuana between patients, and a tribunal of three judges had determined those were illegal under the Michigan Medical Marihuana Act. The case involved Compassionate Apothecary, a dispensary in Mount Pleasant. That ruling allowed law enforcement to shut down dispensaries, though some communities waited for Friday’s Supreme Court decision before cracking down. Compassionate Apothecary was shut down as a “public nuisance.” An overwhelming 63 percent of Michigan’s voters approved the medical marijuana law in 2008, the biggest victory ever for medicinal cannabis. Every single county in the state, even on the conservative Upper Peninsula, approved the legalization of marijuana for medicinal purposes. But seemingly ever since election day, pothostile local law enforcement and city councils have been chipping away at the law, sometimes blatantly ignoring the rights of patients and running roughshod over any protections supposedly contained in the new law. Several cities across the state banned dispensaries outright, while others “adjusted” zoning laws to make their operation impossible. Some cities even tried to outlaw medical marijuana use completely, though those ordinances were struck down. Book Review - Ganja Kitchen Revolution: The Bible of Cannabis Cuisine By Kristi Anderson Oregon Cannabis Connection There is a great new book just released in January of this year titled Ganja Kitchen Revolution: The Bible of Cannabis Cuisine published by Green Candy Press. The author, Jessica Catalano, has combined three of her greatest passions; alternative medicine, healthy cooking, and taking care of people in need. She has put these together in one amazing cookbook. In Washington, the Driving Under the Influence of Intoxicant (DUII) limit of 5ng per ml of blood was a sore point for many, but may have helped uninformed non-users to vote “Yes” when they might have otherwise not supported the measure. The low DUII limit probably gained more votes for the measure than it lost. Elford. "It's time for President Obama to change his harmful policy with regard to medical marijuana and treat this as a public health issue, something entirely within the capability and authority of the executive office." Organizing is critical, as well. Both grass root and top down organizing is critical. Fox explained that it takes time, and is a long process. Constantly and diligently talking with people who are on your side and getting them to join the movement and help, either financially or physically. About 50 showed up for the Town Hall meeting, and all the local news, too! Compiling large email lists to which you can appeal and utilizing social media are also critical. The Colorado A-64 campaign ended with over 25,000 people on their email lists and had a large social network following. Fox explained, “5% of voters in Washington said they heard something positive from friends or family...but in Colorado it was 12%.” “People should be talking to the members of the clergy, doctors, anyone you can get to say that they support this,” Fox said. “Eventually [in Colorado] we were able to have an event where we announced that 300 doctors supported the amendment.” Advertising was trickier, but also important. Late in their campaign, the Colorado organizers actually pivoted from their “education based” campaign which focused on marijuana's harmlessness to a more traditional marijuana legalization campaign which shed light on wasted law enforcement money, prison populations, and tax revenues that could be gained. After a long education campaign, the switch seemed to hit some uninformed voters with information they found persuasive, especially with those voters that are libertarian and fiscally minded. In a diverse state like Colorado, covering all the potential voting blocks is important, including conservatives. Fox explained, “We had conservative, former congressman, Tom Tancredo do radio ads for us that we put on conservative talk radio. We spent a good amount of money on that and I think it was probably money well spent.” Steve Fox and MPP have given Oregonian's something to work towards...legalization in Oregon in 2016. Support is there if we can get our act together as a group, and not let perfection get in the way of good enough. Thanks to Russ Belville, who recorded the entire event and put videos on his youtube channel, www.youtube.com/user/RadicalRuss, or visit www.radicalruss.com. The bill also requires the IRS to produce a study of the industry after two years, and every five years after that, and to issue recommendations to Congress to continue improving the administration of the tax. The Ending Federal Marijuana Prohibition Act follows Colorado’s model of regulating marijuana like alcohol by: Removing marijuana from the Controlled Substances Act; Transferring the Drug Enforcement Administration’s authority to regulate marijuana to a newly renamed Bureau of Alcohol, Tobacco, Marijuana and Firearms, which will be tasked with regulating marijuana as it currently does alcohol; Requiring marijuana producers to purchase a permit, as commercial alcohol producers do, of which the proceeds would offset the cost of federal oversight; and, Ensuring federal law distinguishes between individuals who grow marijuana for personal use and those involved in commercial sale and distribution. States could choose to continue to prohibit marijuana production or use in their states and it would remain illegal to transport marijuana to a state where it is prohibited. Drafting of a good initiative is also important. Should it Include driving penalties, or home cultivation? What about taxation issues, possession limits, and a supply system? Many important issues and should be ironed out ahead so as potential problems can be avoided down the road. While ASA pursues its appeals in the courts, it is also trying to turn up the heat on Congress and the administration. With rescheduling through the courts blocked -at least pending a favorable ruling on appeal -- that is where the action will be. "I'm not optimistic that the courts are going to change their position," said Gieringer. "That means we will have to put pressure on the administration or Congress to do it." But it's important to see that rescheduling is not an end in itself, but a means, said Gieringer. "Rescheduling in itself would accomplish very little in the real world," he pointed out. "It would not end the federal-state conflict on marijuana, and even if it were rescheduled, there is still no FDAapproved supply. All of the marijuana Joe Elford, Atty. for ASA who out there argued the case in the D.C. today would Appeals Court still be an illegal controlled substance without FDA approval." Marijuana policy reform is not just about real world effects; it is also about perceptions, and rescheduling marijuana would have been something of a game changer, as Gieringer noted. "Symbolically, of course, it would have been huge," he said. "It would open the way for prescriptions and help unblock research -the controls on Schedule II drugs are not nearly as fearsome. Still, rescheduling would have been a baby step, but a lot of other stuff has to happen, and that requires an act of Congress, and I haven't seen any sign of that." But the federal courts have so far made clear that they will defer to Congress and the executive branch on these issues. That means that's where the battle will have to be won. What did Kennedy struggle with? It was reported that Kennedy had an addiction to opioid pain killers, which he sought treatment for in 2006. Another glaring point was made by Mason Tvert, a critical A-64 campaign leader, who held a news conference before Kennedy's announcement on January 10th of the SAM launch. Tvert paralleled the current prohibition of cannabis with Kennedy's own family's success from the prohibition of alcohol, explaining, “Why is it that someone who is an heir to an alcohol fortune would want to keep an alternative to alcohol that’s less harmful illegal?” Many drug war basics are not covered by SAM, as Russ Belville, host of The Russ Belville Show online, explained in a Huffington Post article, “...Sabet's SAM never addresses the root cause that leads to all of the devastating consequences in the first place: the arrest of a marijuana smoker for possession or use.” SAM simply promotes a continuation of the status-quo, promoting a continued black market and continued legal action against marijuana users, cultivators, and distributors for a substance that is safer than alcohol. Russ Belville has set up websites to counter the disinformation put out by SAM. He was able to buy up the most prevalent url's! I guess Sabet has a few things to learn about the online world. Visit SmartApproaches.com, SmartApproaches2MJ.com, and SmartApproaches2Marijuana.com. For twitter feeds go to @SmartApproaches . Medical News which could be replaced or reduced can have debilitating and severe side effects, meaning that cannabis therapy resulted in a vast improvement in quality of life. “We know how to extend life, but sometimes it’s not pleasant and can cause a great deal of suffering, so we’re looking to alleviate this, to add quality to longevity,” head nurse Inbal Sikorin said. “Cannabis meets this need. Almost all our patients are eating again, and their moods have improved tremendously.” Marijuana’s chief psychoactive ingredient, tetrahydrocannabinol (THC), was discovered in Israel in the 1960s, and the country doesn’t attach the same stigma to cannabis as is commonly the case in the United States. Medical marijuana was legalized for seriously ill patients in the early 1990s. Though it remains illegal for the general population, even senior rabbis reportedly have no problems with the use or spread of cannabis. According to Science Daily, Klein’s research team includes Dr. Dror Avisar of TAU’s Hydrochemistry Laboratory at the Department of Geography and Human Environment; Prof. Naama Friedmann and Rakefet Keider of TAU’s Jaime and Joan Constantiner School of Education; Dr. Yehuda Baruch of TAU’s Sackler Faculty of Medicine and director of the Abarbanel Mental Health Center; and Dr. Moshe Geitzen and Inbal Sikorin of Hadarim. Klein is now working on another study at Israel’s Reuth Medical Center with Drs. JeanJacques Vatine and Aviah Gvion. He hopes to prove a connection between medicinal cannabis and improved swallowing (a phenomenon which I personally know is very real, due to what I’ve learned from my friend, medical marijuana patient and activist Mimi Friedman, an Ohio native who had to move to Colorado to legally access her medicine). One of the biggest concerns with chronically ill patients is their food intake, and Klein believes that cannabis — which can stimulate regions of the brain associated with the swallowing reflex — will have a positive impact. Duke scientists, not to be shown up, conducted new statistical tests to assess his proposed explanation. They think he is incorrect, and that their original study is sound. A study last August had suggested that marijuana use in teen years can lead to lower IQ scores. But, with holes in the study big enough to drain spaghetti, researchers in Norway have shown that it couldn't hold water. The original study included more than 1,000 people who'd been born in the town of Dunedin, New Zealand. Their IQ was tested at ages 13 and again at 38, and they were asked about periodic marijuana use between those ages. Scientists from Duke University, and elsewhere, somehow determined that participants who'd reported becoming dependent on pot by age 18 showed a drop in IQ score between the first test, at the age of 13 and the second test done at the age of 38. Their findings suggested pot is harmful to the adolescent brain, according to the researchers. Fortunately other scientists did a study, which was published by the Proceedings of the National Academy of Sciences, a respected and peer-reviewed magazine. In their analysis, researchers at the Ragnar Frisch Center for Economic Research in Oslo, Norway, determined that differences in the participants socioeconomic status had not been taken into account, indicating that the trend may have anything to do with marijuana use. With the help of a computer, Ole Rogeberg performed a simulation which traced what would happen to IQ scores over the twenty five years if they were affected by differences in socioeconomic status. Income, education and occupation are some factors in determining a persons status level, and that can have a major effect on a persons IQ, as suggested in other research. When applying the socioeconomic differences, and not marijuana use, he found the same patterns as the Duke researchers. © Tokesignals.com. Reprinted by permission. Cont. from Pg. 10 A unique part of this book is that each recipe is designed to compliment the flavor of certain cannabis strains as incorporated in the recipe. The Strain Flavor Profile and Alternative Strains Guide is helpful for those who are not able to obtain the strain listed in a recipe. For instance, if you don't live in an area that produces a particular strain, you may be able to substitute another while achieving the same flavor profile. There are several delightful recipes for extracting the THC from your marijuana in the Butters, Oils, and Extracts chapter, and you can use these to create the other recipes in the book. There are many tantalizing recipes in each of the sections which are, Breakfast and Brunch, Lunch, Appetizers, Drinks, Dinner, and, of course, Dessert. I think I will be trying a few of these recipes in the near future, like the “Bajan Silver Haze Sweet Bread” or the “Indian Mango Lassi”. Here's a great recipe to get you started: Basic Olive Oil Ingredients: 8 servings of dosed and ground strain of your choice (one serving may equal as little as ½ teaspoon depending on personal tolerance) 8 ounces olive oil On the stove, place the olive oil and ground cannabis into a pan then turn the stovetop onto the lowest setting. Make sure to completely stir in the ground cannabis so that it is totally covered by the oil. Cook this mixture on the lowest setting for 1 hour then remove from the heat and strain with a fine mesh strainer or cheesecloth into a measuring cup. After the olive oil cools completely, pour into a sterilized glass bottle then secure the cap tightly. Store your cannabis infused Basic Olive Oil in the refrigerator. This olive oil will have a shelf life of 1 month when refrigerated. As a precaution, under no circumstances should the cannabis have any traces of moisture content left in it. Any amount of water, no matter how minute, will create the perfect environment in the oil to breed bacteria and can create toxins such as botulism. Make sure the cannabis is 100% cured before infusing. If at any point the bottle begins to cloud, throw it away immediately as this means sources of contamination have taken root in your oil. This recipe for Basic Olive Oil produces 8 servings at 1 ounce each. Your dose per serving will depend on the medication strength you pick. Although some recipes are quite involved, most are easy peezy without the greezy. I highly recommend that you go out and get this book, It has enlightened me and I am anxious to begin using the recipes. Be sure to check out page 13 for more recipes including another from Ganja Kitchen Revolution: The Bible of Cannabis Cuisine that utilizes the Basic Olive Oil recipe. To order your own copy of Ganja Kitchen Revolution: The Bible of Cannabis Cuisine, go to any online bookstore, including the big guys like Amazon and Barnes & Noble (it's about $16.00). Also, visit their Facebook page at www.facebook.com/TheGanjaKitchenRevolution! Medical cannabis consumption can be unpredictable, always start with a quarter serving and give it time. Effects can take up to an hour and sometimes longer. If you have doubts, you should contact a cannabis clinician about dosage. Directions: Place the bulgur and hot water in a bowl, allowing this mixture to soak for 30 minutes. After the 30 minutes is up, drain the bulgur and put into a new bowl. Add the cucumber, tomato, garlic, green onions, Basic Sour Diesel Olive Oil, lemon juice, mint and parsley. Stir the mixture with a spoon until fully incorporated then season with sea salt and pepper. Cover the bowl and put in the fridge for 30 minutes for the flavors to develop and deepen. You can serve chilled or at room temperature. Makes about 4 servings. * Follow the recipe for Basic Olive Oil on page 12 and add the desired dose of Sour Diesel or alternate strain. Preheat oven to 350 degrees. In a saute pan, crisp up bacon, lay on a paper towel and set aside. In a large pot, over medium-high heat, bring two quarts water and 1 teaspoon salt to a full rolling boil. Gradually add macaroni and boil approximately 10 minutes or until pasta reaches desired tenderness. Drain. Directions: Chop up the dark and white chocolate into small pieces (keep in separate piles). Using a double boiler, melt the chocolates in separate bowls. Stir until smooth. Stir the kief or hash into the dark chocolate until it dissolves into the chocolate. Remove the chocolate from the heat. Line a baking sheet with parchment paper. Melt butter and olive oil in a saucepan over medium heat. Add shallots. Saute shallots in butter and olive oil for approximately 2 minutes or until they begin to turn transparent. Add flour and kief to the pan, stirring constantly until a smooth paste forms. Stirring constantly, gradually add milk and continue cooking until mixture is thick and bubbly (mixture should coat the back of a spoon). Add 8 ounces of cheese and 1 cup parmigiano reggiano and stir until completely melted. Remove from heat and add bacon, beer, mustard, garlic powder, pepper and remaining salt. Stir well. Dip the strawberries into the dark chocolate and set on the baking sheet. Dip a fork in the white chocolate and drizzle the white chocolate over the dipped strawberries. Chill in the refrigerator until serving. New Recipes In Every Issue! And Old Ones Available Online! Spray a 9” x 9" square pan with non-stick cooking spray. In the large pot, combine macaroni and cheese sauce and stir. Pour into 9” x 9" baking dish. Combine Panko® with remaining ¼ cup parm and sprinkle over the top. Cover with foil and place into preheated oven and bake for 15 minutes. After 15 minutes, remove foil and continue cooking, uncovered for another 15 minutes. Remove macaroni and cheese from the oven. Allow to cool for approximately 5 minutes before serving. Pinch of cayenne pepper Pinch of nutmeg 12 ounces semisweet chocolate, chopped 1 cup all-purpose flour 2 ½ cups confectioners' sugar plus more for dusting 6 large eggs plus 6 egg yolks 1 ½ teaspoon vanilla extract ¼ teaspoon almond extract Directions: Preheat the oven to 400 degrees F. Lightly butter eight 6-ounce ramekins and sprinkle each with 1/2 teaspoon granulated sugar. Combine the canna butter, cinnamon, cayenne, nutmeg and chocolate in a saucepan over low heat, stirring frequently until melted and smooth. Cool slightly. Whisk the flour, confectioners' sugar, eggs and yolks, vanilla extract and almond extract in a bowl until creamy. Whisk in the melted chocolate mixture. Divide among the prepared ramekins. Bake the cakes until the tops are stiff and the edges darken, 12 to 14 minutes. Remove from the oven and let cool 5 minutes. Loosen the edges of the cakes with a small paring knife and transfer to plates while warm. Dust with confectioners' sugar. and sometimes entire buds are lost. Hy Exp dro er ts !